A busy intersection in the German city of Kassel turned into a lake of frozen beer when some 1,600 bottles smashed after poorly secured crates flew off a delivery truck, police said. Read the whole story at ABC News (no, not that one, the other one). Thanks to Fark.com for the link. They can put a man on the moon, the saying goes, but they can't come up with a decent hangover cure. Considering how hangovers have been afflicting humans since time immemorial, you'd think that finding a cure would be a major public health goal, right up there with clean water and female literacy. Yet there's no war on hangovers, as there is with cancer. There's no multinational race to find the hangover gene. What's the National Institute on Alcohol Abuse and Alcoholism working on, anyway? If ever a Nobel Prize was merited, it would be for the team that finds a hangover cure. Read the recommendations at LiveScience.com. Our next trip: Bad Waldsee, Baden-Württemberg, Germany, January 10-16. A Google Earth map of my planned brewery visits is in the Travels section at beerme.com. Back in October, the BrewCast.NET crew came to Columbus and brewed our latest Impromptu Pale Ale. They came back a couple of weeks later after it was tapped, filled their growlers, went back to Lincoln and tasted it on their podcast. Listen to their show, then take their advice and come drink my beer. Never mind what I said yesterday. Today: clean and fill kegs. Thursday: Brew Uncle Ivan's Dunkelweizen. When I left for Switzerland, we had nine beers on tap. When I got back, there were but six, and one of those ran out yesterday. So I've got some brewing to do. Fortunately the malt I ordered some weeks ago finally arrived, so I'll brew some Dunkelweizen tomorrow and a Weizenbock on Thursday. Once my new batch of yeast show up next week, I'll brew some Gold and...something else that I haven't decided on yet. Then I'll be able to use the harvested yeast for a Wee Heavy and Small Beer I've got on the drawing board. OK, so I was rather lax about posting the details back in October, but this year I again pledged my monthly bonus to be donated to the Gateway for Cancer Research. The details of the pledge didn't change from last year, but the amount did: $735.01, up from $602.17 last year. Thanks to everybody who pitched in! Today is our last day here; tomorrow we fly home. 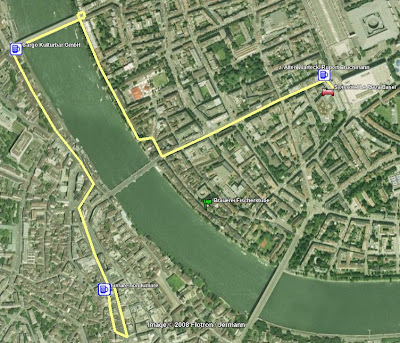 Paris isn't sure how long she'll be at the office today, so I decided to hang around Basel. I wandered around Klein- and Grossbasel this morning, looking for beer and an Internet connection. I never did find Käppelijoch Bier. I did find a reference to a restaurant that may have it, but they wouldn't be open until 4:00pm today. What I did find was fumare non fumare, a pair of identical bars situated next to each other, one for smokers and one for non-smokers. I took advantage of their free wireless Internet access to catch up on some of my typing, enjoying a few glasses of Unser Bier in the process. Paris called and said she was on her way back to the hotel, so I took the tram to meet her there. I got there first and had a bottle of Feldschlösschen Dunkle Perle while I waited. We took a train from Basel to Zürich's Hauptbahnhof, where we found Brasserie Federal. It's a big, busy bar that offers more than 100 bottled and draft Swiss beers. I learned from the bartender that beneath the bar is a bakery, butcher shop, and most importantly, a small brewery where they produce a monthly special beer. So we had a few here, along with some dinner, which was the first time either one of us had eaten today. A short train ride got us to the Zürich airport, and a shuttle bus took us to the nearby Mövenpick Hotel. Have I mentioned that I love Deutsche-Bahn's Baden-Württemberg Ticket? For €18 ($22.75) you can travel anywhere in Baden-Württemberg, by rail or bus, from 9:00am until 3:00am. Today I availed myself of one of these tickets to visit the Gasthof-Brauerei Hirschen in Kenzingen. Despite what the historical marker outside says, they don't brew beer here anymore. They do serve beers from Brauerei Lasser — which coincidentally is the next brewery on my target list — and the food smelled to good to pass up, so I stayed for lunch. I was expecting a plate full of food; instead, I was presented with this kebab suspended over rice, peppers, tomatoes, and dates. The waiter doused the kebab in liquor and set it alight at my table. On the side was a plate of french fries. I had to go back through Basel to get to Lörrach. A short layover in Freiburg gave me time for a Ganter beer in the train station. Once I got to Lörrach, it took me a few minutes to find the Brauereigaststätte; it's actually around the corner from the brewery's main address. It was really quiet there when I came in, but it turned out that they're only open until 4:30pm, so I was one of the last customers. Paris and I had dinner and a couple of Warteck Dunkles at Restaurant zum Alten Warteck across the street from our hotel. There is snow on the Alps, and there are a few flakes falling here in Bern today. I started the day off by getting lost: I walked right off my map without even leaving the Bern Bahnhof! Brauerei Egger of Worb doesn't have a pub, but their beers are available in Bern at Restaurant Brasserie Anker. Lunch was an excellent creamy barley soup with bacon, a salad, and pork schnitzel with pasta and mushroom gravy for CHF17.50 ($14.35). The #21 bus took me north of downtown to Brauerei Felsenau. Their beers are available at the nearby Restaurant Felsenau, on the hill above the brewery. The skies had been cloudy all the time, but they cleared enough this evening that I could catch this nice arrangement of the Moon, Venus, and Jupiter over our hotel. Back in Basel, we met Paris' colleague Marco and his charming wife Paloma for dinner at the Pinguin for beers and dinner (in that order). The hotel's breakfast buffet is CHF29.50 ($24.50) per person per day. I'll be buying pastries at the train station for the rest of the week. It's overcast and maybe a bit chilly — around 2°C — and the people here are bundled up like we're at the North Pole. I have a light jacket that I'm carrying more than wearing. I arrived at Waldkirch around 11:30 and walked 15 minutes or so from the train station to Brauereigaststätte Stadtrainsee Waldkirch. Aside from four pretty good beers, lunch consisted of a creamy green bean soup, salad, and bits of pork in mushroom gravy with french fries for €5.50 ($6.94). Good stuff! A bus and a train got me to Riegel am Kaiserstuhl. Rather than wait five minutes for a three-minute bus ride into town and a five-minute walk to the brewery, I decided to walk the 2km in the rain. I arrived at Brauhaus Riegel around 2:45. A couple of their beers are brewed and bottled by Fürstenberg, and the rest are brewed on-site. I got to drinking and talking to the folks here, and pretty soon I had missed my bus. Martin offered me a lift to the station to catch the 6:30 train. I was just pulling into the Basel station when Paris called to find out when I'd be back at the hotel. We met up with Paris' colleague Melissa and headed for the Cargo Bar. It's hard to find, being on a street below the main streets, right next to the Rhein. The brewery website said that Steinegger Bräu would be available here, but it wasn't. Instead, they did have a couple of beers I had never tried, and a couple more that I had. We got back to the hotel sometime after midnight and had a Feldschlösschen Dunkle Perle before turning in.